This is the result of a guy borrowing his friend's Ferrari 360 Modena and trying to show off to his new girlfriend. The engine ended up 300 feet down the road, thankfully they were both OK. This driver accidently put his friend's Porsche 911 into reverse and drove off a boat ramp - oops! Do you think your friends care about all the time and energy you've put into keeping your classic Jaguar in pristine condition? Nope - they just want to see how fast it can take a curve. 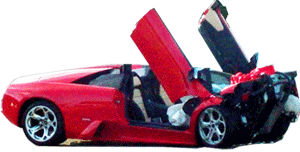 A Lamborghini Murcielago produces over 600 Horsepower. That's nearly 4 times more powerful than your standard car. Don't let your friend, who's never driven anything but a Camry get behind the wheel of your Lambo - or this happens. The only thing worse than letting your friend borrow in the first place is to let them take the car on a race track. Not only will your insurance not pay for it, but they can cause damage to other cars, like this guy did with his friend's Porsche 911 GT3. Crashed into several spectator's cars. The owner of this BMW M3 let his friend drive. Like Wyle E Coyote, he went straight off a cliff. The owner of this Aston Martin Vantage thought lending his prized possesion to a friend for his wedding would be a nice thing to do. He regreted the decision only 10 short minutes later. The owner of this Porsche 911 GT3 is lucky to be alive. He let his friend drive back from a track event, while he sat in the passenger seat. Seriously, don't let inexperienced drivers put you at risk in your own car.